During November of last year, Cold Spring Harbor Laboratory hosted the fifth U.S. meeting of Single Cell Analyses. 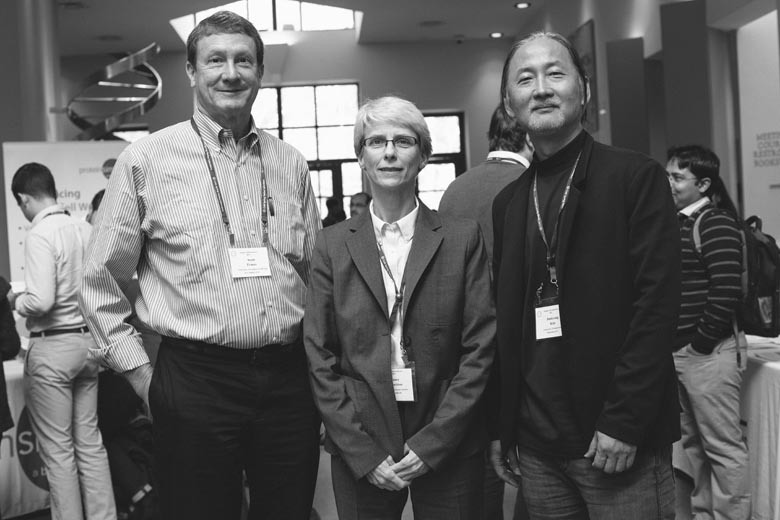 We met with meeting organizers Nancy Allbritton, Scott Fraser, and Junhyong Kim to chat about the biennial meeting. Their chemistry as an organizing team would have easily been picked up by those around us but, as our conversation quickly revealed, their chemistry extends beyond their jovial banter. But before we contemplated that great question, we examined the overall structure of the meeting and recent changes made to it. Junhyong: Every year, we think of something special to do. In 2015, we incorporated Nancy’s idea for technology discussion bites and had a session with NIH about future planning. Actually, a part of the Human Cell Atlas discussion started at that meeting. Scott: Another thing we’ve changed is how we embrace the contributed abstracts in the oral sessions. When this meeting started out and was smaller, there was a need to draw in a larger set of invited speakers. Over the years, we’ve reduced the number of invited speakers and made space for more contributed talks, and they’ve been amazing. Nancy: I like the way we have a lot of people speaking now who submitted abstracts; I think that has kind of bookended the invited talks. The lightning talks were another big change we made this year that was an amazing success. Junhyong: Even with that change, I was glad that we didn’t pack the schedule. We had a lot of time to have good discussions and questions this year. Nancy: That central framework of not getting overly busy works for this community. It was laid down by Jim Eberwine and Xiaoliang Sunney Xie for the first meeting in 2009, and we’ve carried it over since then. Scott: Also, we have one poster session but we keep the posters up throughout the meeting. They were pretty well attended this year and the exchange has been great. I actually went back to see more of the posters after the session, and I know a number of people made appointments with poster presenters so they could have one-on-one discussions. Junhyong: Every year, we make a point to reach out to a new community. In 2017, we introduced a session on evolution in cell biology. Scott: We’ve even discussed how to formalize the community that session represents to really set the agenda for that field. It’s one that’s just emerging and over the years, we’ve been good at identifying emerging fields. Some of the quantitative ‘omics, like proteomics, started as parts of sessions here too. A benefit of having three of us from three different areas on the organizing team is it opens the door for seeing new areas that any one of us might have ignored. Junhyong: Yeah, it’s really fun to talk to first-time participants – like many of our invited speakers. They always remark how this meeting is a unique experience because of the diversity in the science. Scott: In both the science and the participants, who are heterogeneous in origin, age, and the sorts of positions they’re in. And the audience diversity is maintained during the sessions. In some meetings when it becomes DNA, all the DNA people stay and everybody else leaves. But at this meeting, the different communities hang in there and, as a result, the questions and discussions are really good. The meeting is in a sweet spot: it’s big enough that it has great diversity but small enough that you actually feel like you can meet people randomly. Over the last few years, the number of meetings catering to single cell biology has grown. Below is how the organizers see the CSHL meeting as filling a distinct niche. Scott: Well, one of this year’s speakers said this was the first single cell meeting they've been to that wasn't essentially a DNA sequencing meeting. Nancy: THAT’s what I really like about it. You hit the nail on the head. There are beginning to be a lot of single cell meetings now. Ours has a good mix of applications and technology, and of younger and older participants too. We three have very, very different backgrounds, so we end up with a nice mix of speakers that none of us - if we acted alone - could come up with. Scott: Or convince to attend. Scott: And we keep the DNA sequencing in because we feel sorry for one of the organizers. Nancy: There were a lot of great questions, discussion, and interactions this year; particularly between technology people and applications people. Scott: And the discussions weren’t the converted preaching to one another, but people sharing ideas or vantage points, and arguing about the relative benefits of different approaches. In fact, the biggest problem for some of the speakers was the ability to go out and grab a cup of coffee during the breaks because they received so many questions, even after the Q&A sessions. One of the nice things about Cold Spring Harbor meetings is that the space and surrounds are really conducive to people spending time talking to one another. It makes it very easy to come up with the next killer experiment. Junhyong: Absolutely. During this meeting’s almost ten-year history, we’ve emphasized pushing the boundaries of measurements and analysis, so that everybody can come here and learn. I think that’s a unique feature of this meeting compared to some of the other single cell meetings. Junhyong: We need some Starbucks up here. Scott: A barista would be really good, at least for the core organizers. And a sushi chef. Scott: But seriously, one of the few groups that I think is under-represented at our meeting are those from teaching colleges. With the meeting taking place during term, it's difficult for them to get away. Nancy: There are some schools where a lot of good, undergraduate-powered research is being done, and that’s who we’re missing; they would benefit from attending this meeting. Junhyong: The single cell field itself can be a little expensive. People from teaching colleges can certainly come here for the science, but it’d be hard to take the science back to their institutions. Scott: It’s an expensive technology but you don’t have to do just the Cadillac. Some biostat people I’ve met have been very good at teaching the underlying math and graphics. Nancy: Also the protein stuff can be done, like the degradation work we saw this year. Even Amy Herr’s single cell western blots are pretty inexpensive relative to RNA-Seq. Scott: Now that this meeting has grown, it would be nice to make it known that there is financial aid for groups like those from teaching colleges or grad students. Junhyong: At Penn, Jim [Eberwine] and I run an annual single cell biology symposium. It was initially attended by a very small number of people but every year more and more people doing disease, translational, or clinical research come to it. Scott: Yeah, that may be another community we’re under-serving right now. Nancy: I’d almost target that community before the predominantly undergrad institutions, since clinicians are sort of the end-result users of single cell technologies, with patients as the beneficiaries. The Single Cell Analysis course in the summer actually trains a lot of clinicians. Scott: The translational aspect of single cell analyses is exciting, one that’s just really exploded. Bringing more clinicians to the meeting would help us foster translation of the technologies. In the predominately undergrad campuses, we’d foster education which, I would argue, is pretty important too, given the number of students who started at schools where there’s a real research culture but not the huge research funding. Nancy: Seeing the technologies beyond RNA and DNA begin to mature. Scott: One important development is that we’re moving single cell analysis into cells and their normal contexts. Previously, many single cell biologists were trying to isolate single cells and study them without controlling their contexts. At the 2017 meeting, most of the talks brought in the interactions between individual cells, the things that must be going on in your body and mine right now because we aren’t just a clump of single cells. The Single Cell Analyses meeting returns to the Laboratory in 2019; and during the summer, we offer the Single Cell Analysis course. For an introduction into the course, be sure to read our Q&A with 2017 Single Cell Analysis Alumnus Kenny Yu and watch this video from the 2017 instructors, TAs, and trainees. And for fun, below are three photographs that perfectly depict the chemistry between Nancy, Scott, and Junhyong. Lastly, for more conversation with other meeting organizers, check out the rest of our A Word From series.